This trio at the Columbus Circle subway stop plays superb jazz music. They're also representative of the great diversity in this city. 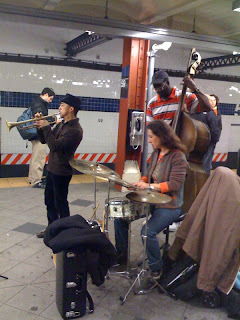 But when musicians like these aren't around to entertain you while you wait for the subway, an iPod is your best friend, especially when you get on the subway. Seriously, an iPod in this city is probably one of the most essential must-have items next to your coat and cash. It's like a shield here that prevents people from attempting to talk to you. Apple must love the Big Apple.